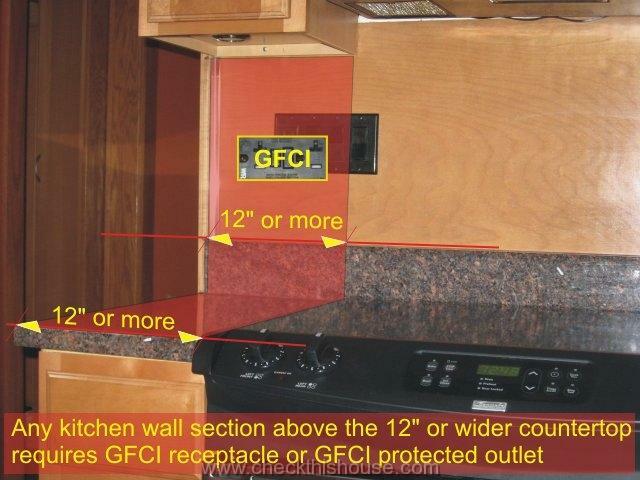 Kitchen GFCI receptacles are required by the 2008 NEC (National Electrical Code) to be installed along the countertop surfaces. If you have an older kitchen, and for any reason decided to replace a regular electrical outlet – you should have a GFCI receptacle installed as a replacement. Kitchen electrical outlets installed above the countertops require at least 2 small appliance branch circuits. Example: for 5 kitchen GFCI receptacles serving countertops there should be a minimum of 2 circuit breakers (or two fuses) in your electrical panel – one protecting 3 of those outlets, and second responsible for other 2 (or 4 & 1 – it doesn’t matter). Those two or more electrical circuits supplying power to the kitchen GFCI receptacles (above the countertop) must also serve remaining kitchen open walls, pantry and dinning room receptacles. However, they can not be used for the kitchen lighting or outlets located within the cabinets or cupboards (sometimes used to for a under the cabinet lights low voltage transformer or regular voltage light fixtures, microwave or other permanently installed appliances). GFCI protection is not required for those extra receptacles, but since installed on a 20 amp rated circuits, they must be also 20 amp rated. 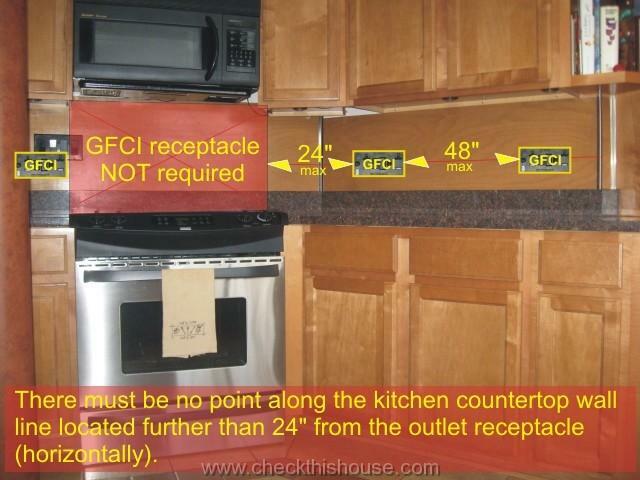 There must be no point along the kitchen countertop wall line located further than 24″ from the GFCI outlet receptacle (horizontally). Most of the new appliances are equipped with very short electrical cords to prevent them from overheating, tangling, etc. 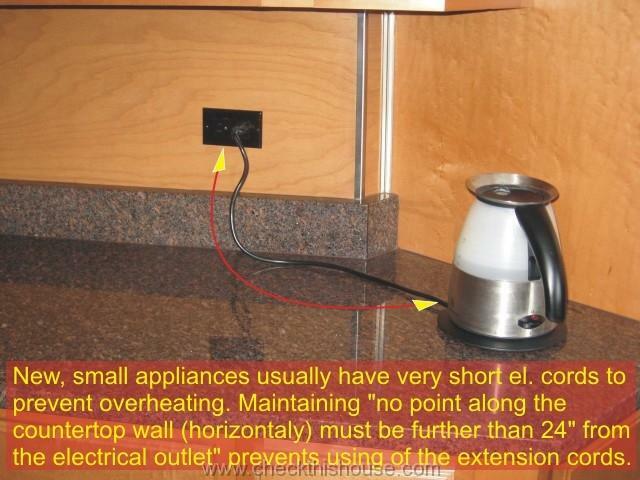 Because of those short appliance cords, electrical outlets spacing should be maintained so close. However, no electrical outlets are required on the wall directly above the kitchen range, cook-top or sink. Kitchen refrigerator power supply does not require GFCI protection, just an individual (15amp rating or more) branch circuit (if you have a refrigerator in the garage or an unfinished basement, 2008 NEC decided to put it on a GFCI protected circuit). You can use one of the two small appliance GFCI protected circuits, but an individual circuit makes more sense for this purpose. 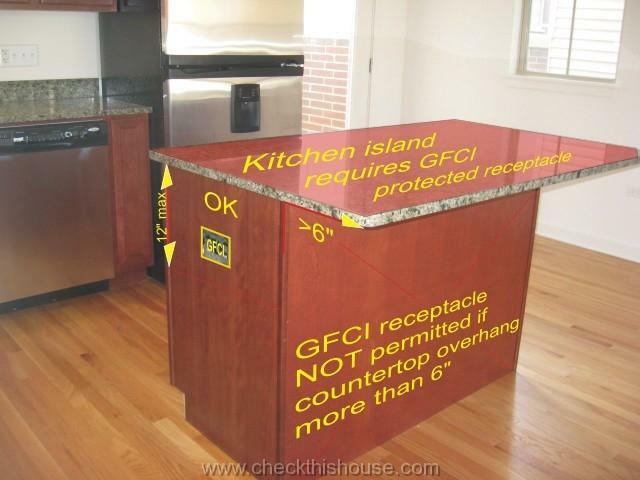 Kitchen GFCI requirement also applies to an island and peninsula countertop – if it has a minimum dimensions of 12″ x 24″ it requires at least one GFCI protected electrical outlet. 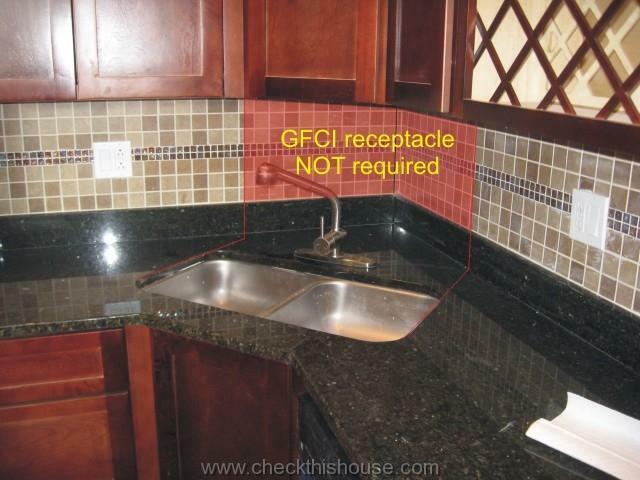 In case you have a larger island (or any) countertop, divided by the sink, or a cook-top, range, etc., and there is less than 12″ of counter-space behind that dividing sink or appliance – each of the sections would require a GFCI protected receptacle. Not more than 12″ below (island and peninsula with no backsplashes, dividers, etc.) if the countertop overhang is 6″ or smaller. Those side wall receptacles create a safety hazard for children reaching them or anyone accidentally brushing the hanging cord, but often this is the only choice. I would highly recommend to use that kitchen GFCI protected receptacle under supervision (if you have small children), and remove the plug as soon as you’re finished. Garbage disposer, dishwasher, microwave do not require GFCI protection, and can not be supplied by the small appliance circuits. Depending on the amount of power they need (check the nameplate or installation instructions), you can either use 1, 2 or 3 circuits (if nothing else will be on those electrical circuits). No face-up kitchen GFCI receptacles (and no unprotected devices of course) are permitted!